This posting from Alhambra Partners take a great broad look at factory orders in the US over the past year (and a little further). 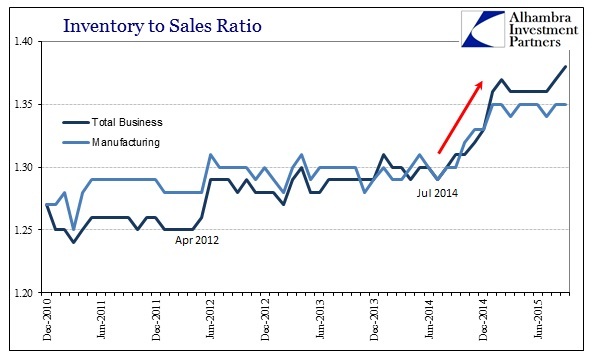 The main takeaway is that factory orders have been declining for a full year now. Further this to the increase in inventories and it seems we might have a problem. 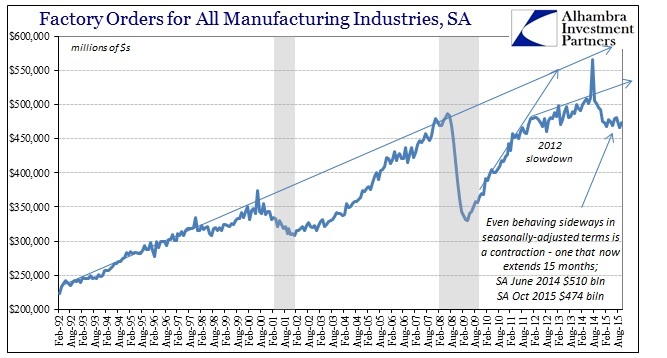 As the manufacturing recession becomes more and more unassailable (and I mean that in more than one way), the fact that it still shows no end or let up suggests still greater difficulty beyond manufacturing. As feedback loops become more established and robust, and thus convince more and more non-manufacturing firms to adjust instead of waiting out for Janet Yellen’s assurances to prove just once useful, the economy can only perform further negatively and among a growing contagion. The latest update in factory orders was perfectly consistent with the rest of 2015 so far, which is again a highly negative suggestion about future economic performance. Factory orders are forward looking by their nature, orders after all. October’s estimates were 5.7% less than October 2014, following 7% contractions in August and September. Year-over-year, factor orders have declined for exactly twelve months, meaning now a full year of contraction in orders. Seasonally-adjusted, factory orders were higher in October than September which means nothing toward suggesting anything but monthly variation. Even in these adjusted estimates, the recessionary imprint is perfectly clear. The last peak was June 2014 (not counting the enormous, one-off surge last July) with as estimated $510 billion in orders for future product. Every month after that (again, not including July) has been less, a run of fourteen months that precludes anything like an “anomaly”, “aberration” or especially “transitory.” Continuing month after month at 7% or more below the prior peak is not just significant, it is downright alarming. That concern relates to the forward nature of new orders and how they have already sunk so far for so long. The 6-month average Y/Y change at again almost -8% is very close to the worst of the dot-com recession. But that recession lasted, in terms of factory orders, a total of 15 consecutive months of contraction (starting December 2000, three months before the official beginning of the recession) and 17 out of 18. Its deepest point, in terms of the 6-month average, was achieved 10 months in. 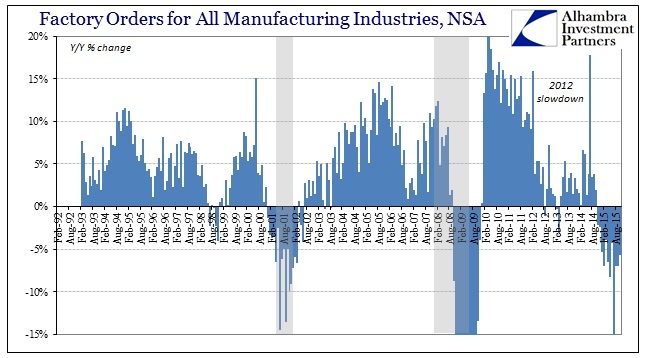 While it is not impossible that the current manufacturing recession has reached a trough, unlike now that contraction in forward orders (and then actual production) realized its economic balance through inventory. In other words, the cuts in production and orders were more than enough to match production to lower sales and taking inventory levels down, too. A review of inventory during that recession shows that quite clearly. 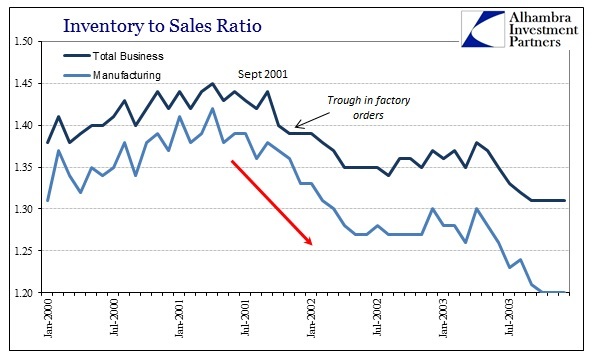 Factory orders kept sinking more and more until inventory levels started into significantly reversion; the more inventories rose, the more orders sank. Total business inventories peaked around September 2001 (manufacturing inventories a little earlier) and factory orders hit their sustained worst just a few months later. Despite the persistent production cuts and orders already in 2014 and 2015, there has been no progress in harmonizing production to sales through inventory. After more than a year, production is still far out of alignment with sales even though both sales and production are, and have been, declining. Unlike the dot-com recession at this point, this far into it, the only suggestion is not recovery but more sustained and likely deeper cuts to come. Inventory, as noted even by GDP in Q3, has suspiciously only grown more out of alignment. Sales are obviously then, by simple math, falling faster than production which means that either sales need to surge or production needs to collapse even more. It is difficult to interpret the current inventory imbalance as anything other than an expectation for the former, and that businesses appear to be still holding out for Janet Yellen’s version of the economy even though it has already failed so much so far for this long already. Given the chatter in retail about the holiday season, it seems increasingly likely that this Christmas is the last chance to see any serious sales improvement before the true feedbacks begin to geometrically induce the latter negative adjustments. In short, it is a manufacturing recession that despite being a recession hasn’t achieved what recessions are supposed to achieve; therefore it is very likely to continue and at some point just break. It’s a discomforting assertion given the comparisons to the dot-com recession so far, with nothing to show for it. If the economy has already “achieved” equivalence to a mild recession, what’s next?